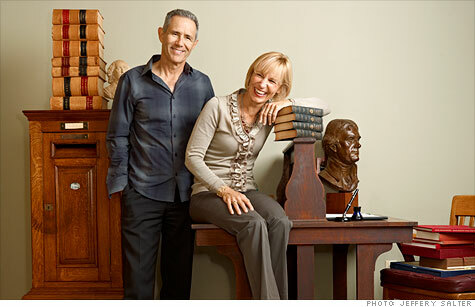 Levenger founders Steve and Lori Leveen: "If things didn't work out," said Lori, "I could always go back to IBM." Lori Leveen: I studied history at Vassar, and after graduation in 1979, I decided to move to New York City with some girlfriends and got a job as a medical-malpractice underwriter. Steve Leveen: I moved to New York after finishing a master's in sociology at Cornell and worked as a journalist. Lori and I moved to the city two weeks apart and worked in a building two floors apart. We met on a subway -- the No. 1 Broadway local. Lori: We moved to Washington, D.C., where I got my master's in international business diplomacy, then to Boston. It was 1985, and I became a marketing rep for IBM (IBM, Fortune 500). Steve: I was in charge of new-business development for a software company. I made a cocky statement to the president that a certain product should get approved by the board or I should move on. The board didn't approve the product, and I was fired. In retrospect that was what I needed to launch out on my own. In 1987, Lori was pregnant with our first son, but we decided the time was right to start our own company. Lori: We thought if things didn't work out, I could always go back to IBM. We're both avid readers, and I noticed that in many homes there was no great place to sit and read. I had an old-fashioned lamp, and Steve and I would fight over who got to sit under it to read. 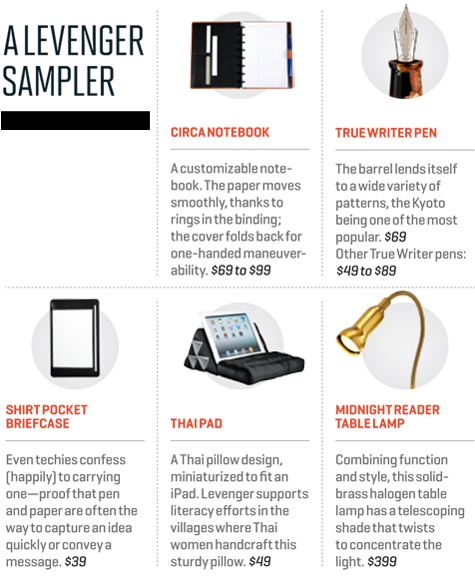 So we went around to stores to research reading lights and decided to assemble a collection to sell to readers. Steve: I had some severance and did some graphics work. I sold my 1986 Mitsubishi Montero for $8,000, then cashed in an IRA for $12,000. My father kept us in groceries for two years before we took a salary. He gave us his old Cadillac; to his dismay, I promptly sold it and put the $12,000 into the business. Lori: Our first catalogue was one piece of paper, folded twice. We put together some ads and put them in the New York Times and the Boston Globe, but didn't get much response. Steve: We thought we might have to give up and go find jobs, but as a last-ditch effort, we put an ad in The New Yorker saying "serious lighting for serious readers," and people started calling. The ad ran Oct. 12, 1987, which was my birthday, and by Christmastime we had 47 customers. Lori: I remember getting our first check in the mail. Steve was so excited he got on the floor and spun around. Steve: We started with halogen lights. Our first successful product was sold as a computer lamp, but people wanted it for reading in bed without disturbing their spouses, so we repositioned it as a reading lamp. We did almost everything out of our home. A neighbor rented us his garage, where we held inventory. I'd have the baby monitor in the garage up the hill. Lori would give me instructions, and I couldn't talk back. Steve: We decided to take care of the customers and eat the cost. We lost a lot of money but would not lose customers. Lori: You can either take things as a challenge or crawl away, and we put on our boxing gloves. We soon expanded beyond lighting because we got calls from bookstores that said their customers were looking for a dictionary stand or bookcase. Steve: When the neighbors started to complain about the UPS deliveries coming every day, we knew it was time to find office space. My dad was in Florida, and I was ready for a warmer climate. So in 1989 we moved south, renting a warehouse in Delray Beach that had a retail store in front. Lori: It was 1990 before we turned a profit. Steve: A lot of that was due to Ric Leichtung, a retired mail-order merchant who came by our store one day. He taught us about details we knew nothing about -- pricing, the importance of gross margin, copy writing. With his help, we did our first color catalogue, got a list broker, and spent our first real investment of $25,000 sending catalogues to 50,000 names. Within a few cycles, we were making money while acquiring customers. Our sales doubled for several years to $24 million in the mid-1990s, enough to buy the land, warehouse, and our headquarters. Hard times came at the end of the 1990s. We made the mistake of hiring more people to do the fulfillment at the warehouse without looking at how to be more efficient. So we had to lay off people. When we moved to the Internet in 1996, it cost a lot to create a good website, but sales came mostly from existing customers who ordered online rather than pick up the phone. So we still had to mail the catalogues. The Internet has increased the complexities and cost of the business but has not delivered as much incremental revenue. Lori: There's been a huge change in reading. People are going between the electronics and books. But they still want a light for reading and something to prop up their book or iPad. We're still relevant to people as they make the transition. Steve: We have the opportunity to invent the future for pens and paper notebooks. Candles were made obsolete by the light bulb years ago, but we all have candles in our homes because we like them. We need to do that with paper, pen, leather goods, and wood. Babies are growing up with iPads. If we don't get it right in the next 10 years, we may miss the opportunity. Like everyone else, we're recovering from this recession. We had five retail stores and took it down to three. We reduced our catalogue circulation, cutting mailings to existing customers and prospects. Lori: We moved our warehouse to Memphis to be closer to distribution points and didn't need the space here. So we sold our office building three years ago and used the proceeds to help fund the business. Steve: From the start, we wanted to do something significant. We're not saving the world, but the people buying from us are -- the scientists, doctors, attorneys, people whose work can change the world. We're honored to make stuff for them, especially in this digital age. Just start. You can study something to death. Get started and learn from your customers. At some point, if your gut says you're ready, you've got to take the leap. The more mature a business becomes, the more important business plans become, but write them at the right time. Don't solve all the problems yourself. If you continue to be the one solving the problems, your business will never grow beyond you. Your colleagues need the opportunity to grow. They need to be accountable for their decisions, make mistakes, have their own successes, and have the chance to enjoy the fun of business. Practice conscious capitalism. You can have a broader view of stakeholders -- beyond shareholders -- and a company can do well by doing good. Our Partnering for Good program sources products in developing countries and gives money back to the villages to support libraries and reading programs. It's a competitive advantage to think broader and act broader.